Sometimes when you write an article, review or letter you need to take into consideration the age and education of the reader. Your choice of words and sentence structure should reflect the audience. Your five year old nephew will thank you for it, as will the professors on your college. But how do you know if your writing is appropriate for the audience? Like most other things in life, someone tried to answer that question with a formula, or algorithm. 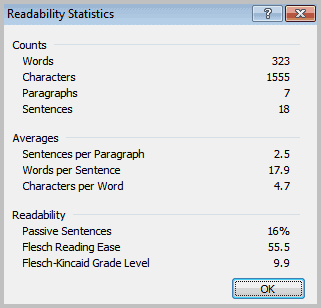 Microsoft Word offers readability statistics, but only if the feature is activated by the user. It is turned off by default. Here is a quick guide on how to enable the readability statistics in Microsoft Word. Please note that I'm using Microsoft Word 2010, and that the setting may be at a different location in previous versions of Word. Click on File and then Options. This should open the Options window where the majority of configuration changes can be made. Locate Proofing on the left side and click on it. Place a checkmark into the box next to show readability statistics and click the OK button afterwards. This enables the feature. You won't realize directly that it has been activated. That's because it is linked to proof reading, which was already indicated by its location under proofing in the options. The easiest way to bring up the readability statistics is to press F7 to run the spell checker on the open document, or by clicking on the Review tab and then on the Spelling and Grammar button. The Readability section displays the percentage of passive sentences, the Flesch Reading Ease and the Flesch-Kincaid Grade Level. The Flesch-Kincaid Grade Level transforms the Flesch Reading Ease score to a United States grade. A grade level of 9.9 as shown on the screenshot above is expected to be understandable by average 9th to 10th grade students. If you are a Word user, are you using the Readability Statistics? Glenn I have tested the feature under Office 2010. 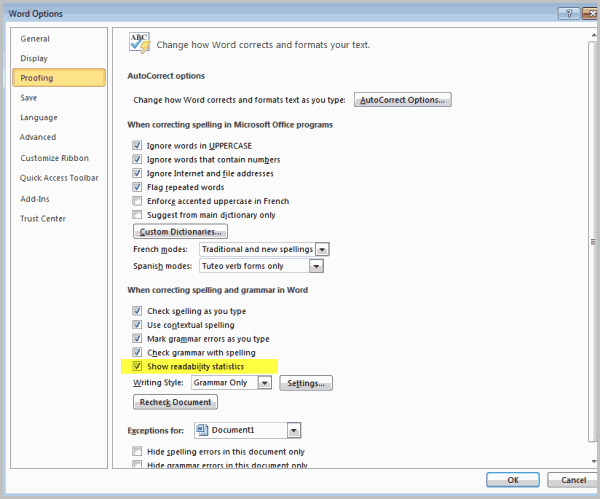 I cannot really say if it is limited to Word 2010, but if you have the feature in your version as well, it should work. My main editing language is German, UK, US in that order. Have you tried the feature with an active document? i have Word 2007. is there a trick to turning on the % count for Passive Sentences? I’ve got it checked under Grammar & Style, along with all the other boxes. But, i always get 0 (zero) when i click on Readability Stats. Even when i compose a paragraph that is 100% passive voice sentences, when i click on RS, all it shows is zero next to Passive Sentences. however, all the other RS measures (words, characters, sentences, etc) do NOT show zero; they all seem to be functioning.